Swarovski crystals? OK, why not. 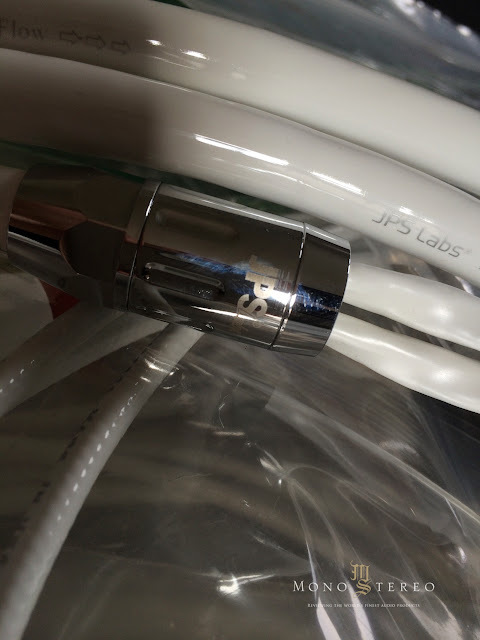 JPS Labs has been around for quite awhile now, actually, since 1990 so I guess they have accumulated a wealth of knowledge and experience in regard to cables. Sounds serious to me but what exactly is Alumiloy? 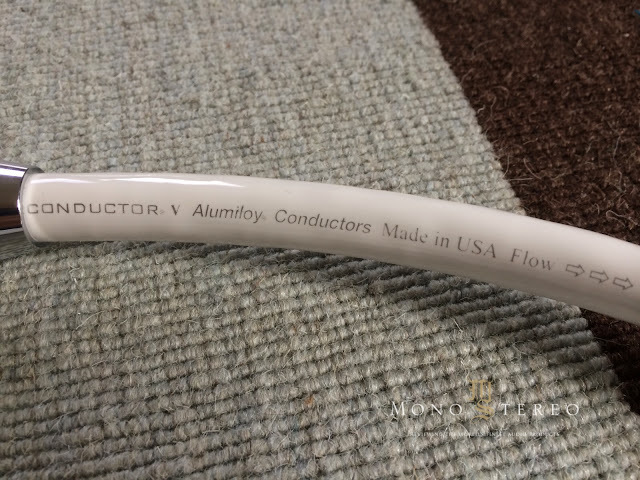 Since this is a patent-pending composite conductor material, exact specification will remain a secret but that`s understandable. 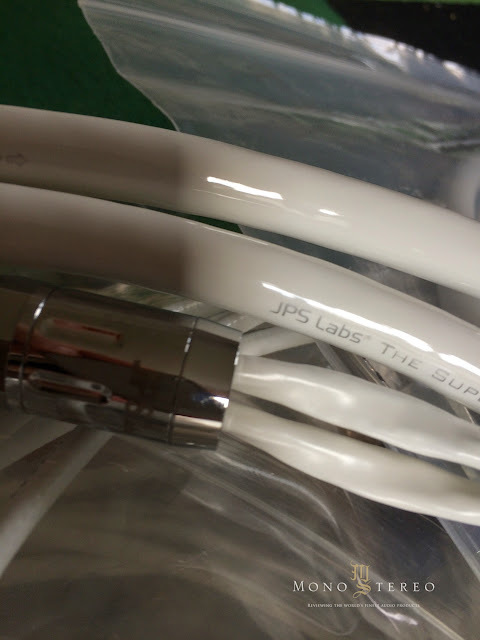 JPS Labs labs sent a complete set of cables for the review. Their Superconductor V interconnects, the Superconductor V XLR interconnects, the Superconductor V USB, the Superconductor V Digital, Superconductor V Single wire speaker cables and the Kaptovator Lite power cord. The Superconductor V interconnects looked very elegant and the used RCA connectors were refreshingly different in shape and for the left and right markings Swarovski crystals were used, one in blue colour the other transparent. 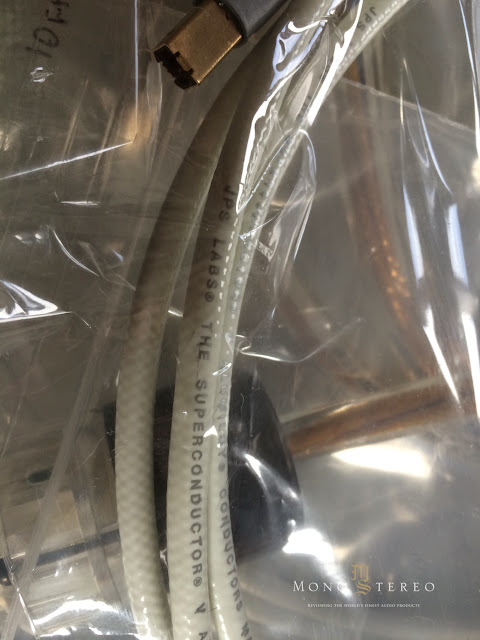 The Superconductor V Speaker cables were sent in a single wire configuration and with 7.8 mm2 / 8.5 AWG x 2 conductors for two terminals. Although already the Superconductor V interconnects looked great in white, the Superconductor V speaker cables looked even more impressive being quite thick overall and using rhodium plated bananas, again with Swarovski® crystals marking polarity. The Kaptovator Lite power cord on the other hand had a clear, transparent outer jacket and used Wattgate EVO connectors (also transparent). Kapton was used as a dielectric. The Kaptovator's conducting wire is stranded, but wound so tightly that it mimics the construction of a solid-core design. Promising to bring the ultra-high resolution of their reference AC cords to lower power components, raised the bar for the expected performance levels. I have started with the Kaptovator Lite power cord, used on the DAC. The first impressions were all highly positive: the Kaptovator Lite sounded very clear, open, smooth and natural. I have noticed a slightly warm effect on the reproduced music but not in the sense of coloration, but rather from the absence of “cold” type of distortion - odd order harmonics. Audio is many times full of those harmonic distortions and many people unconsciously take it for granted, accepting the subjectively “cold” and hard sonic signature and consider it as a sign of “neutrality”. Anyway, the Kaptovator Lite power cord was exactly the opposite of the thin, hard and colourless in its presentation of the music content. A number of power cords, especially the cheaper ones, are able to reproduce only the basic tones without overtones that allow us to distinguish between, say, a nylon stringed guitar and a folk one. There is a big difference in coloured and colourful music reproduction and since music isn`t all about frequencies and sound pressure level and tone duration, we should strive for the latter. The Kaptovator Lite power cord on the other hand didn`t sound mellow and lifeless, quite on the contrary, the music sounded lively and vibrant, full of details that appeared self evident and unforced. The bass was built on a very solid foundation with excellent control, power and extension and likewise could be said for the ever important and crucial lower midrange area which had weight, control and showed great dynamic abilities. It came as no surprise that the Superconductor V interconnects showed much the same behaviour as the Kaptovator Lite power cord and even went a little further in bringing out the best in recordings. 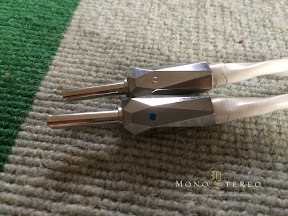 The Superconductor V RCA and XLR interconnects were fully capable of extracting the last ounce of information out of music but still delivering the goods in an analog, stressless way that ensured long listening sessions without any listening fatigue. Neutral and transparent across the whole spectrum, with a level of microscopic like insight that goes beyond its price region with ease, all this made for a very inviting sound experience. The Superconductor V USB cable made the music sound very fluid but also lively. Like with the rest of the Superconductor V cable line, it succeeded in making the digital source sound very much analog-like. Nothing stood out across the whole spectrum, yet the music still breathed with tons of air and effortlessly delivered details in a very relaxed manner. The timbre/tone was reproduced remarkably well throughout the whole spectrum, which is a direct result of the cable being able to accurately portray the proper harmonic structure of instruments and voices. Everything I have written for the Superconductor V USB cable could be used to describe the Superconductor V Digital cable, but somehow I have felt that the coaxial version was even smoother and with further reduced levels of grain. The Superconductor V speaker cables introduced an enhanced sense of authority into the sonic picture - without loosing any of the desirable sonic traits of its siblings. The subjective weight of the instruments like piano or massed strings was delivered in proper proportion with the rest of the spectrum. It`s interesting how much the upper frequency regions improve when the lower midrange gains weight, authority, control and behaves dynamically; every musical event sounds far more interesting and believable. 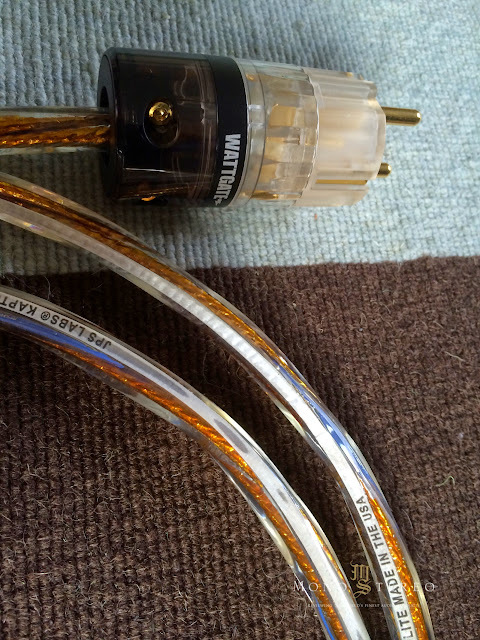 The relatively big cross section area of the The Superconductor V speaker cables ensured very good current transfer flow from the amplifier and excellent damping of the speakers` woofer cones. 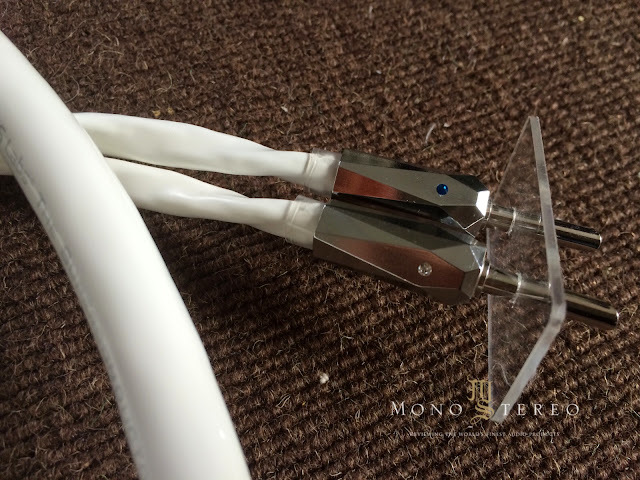 From my experience the speaker cable cross section area plays a BIG role in the perceived and actual dynamic behaviour, but high current capability and good balance of capacitance and inductance parameters are somewhat difficult to achieve. 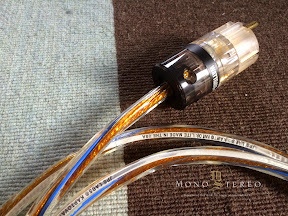 Here, knowledge and experience of every speaker cable designer are put to test. 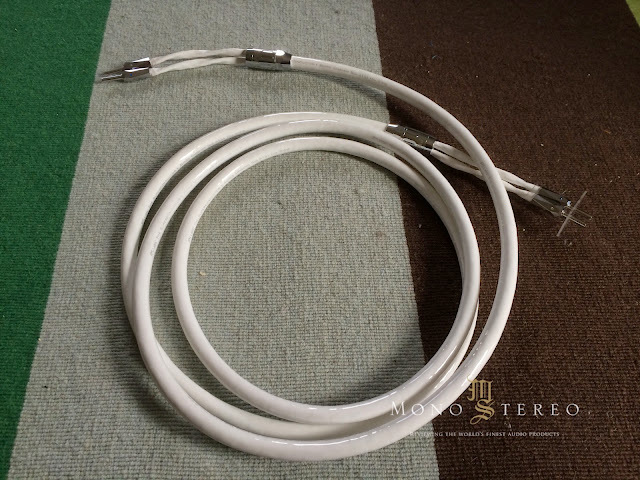 The Superconductor V speaker cables certainly proved they are excellent all-around performers and could be used in top performing systems, regardless of price. When I listen to the music I seek “time machine” capabilities from the system components, meaning I want to be transported to the original event as much as possible. Some components fit into that category more than other and they really make all the difference. In my view this has something to do with the component`s ability to bring out the best in the music material, highlighting the good aspects and while not covering up the bad aspects but still rather making them less prominent and annoying. Things like bad mixes, skewed spectral balance, too much compression, etc, can take a back seat in favour of the soul of music to step forward and enchant the listener. I believe every music lover lives for moments like this. So much beautiful music was written long time ago, for instance, Firefall, the self-titled debut album containing their rendition of "It Doesn't Matter" (written by Chris Hillman, Rick Roberts, Stephen Stills) still brings back fond memories of the musically very fruitful seventies era. Firefall is a rock band that was formed in Boulder, Colorado in 1974. It was founded by Rick Roberts, who had been a member of the Flying Burrito Brothers. The band's biggest hit single, "You Are the Woman" is a silly song but "Cinderella" is a country rock track that sends a shiver up my spine every time I hear it and with the help from the JPS cabling I was able to enjoy it immensely. The recording itself isn`t exactly of audiophile quality but hey, it`s the music that matters! The soothing vocal harmonies, the acoustic and electric guitar interplay, the rhythmic drive - everything was reproduced effortlessly. The JPS Labs cabling did not try to bring attention to itself with certain aspects of the reproduction that would stand out but rather it served the musical message and make it come out intact and at all times it was more than capable to bring out the best out of the recording. The Reference Recordings` HI-FI Spectacular performed by Eiji Oue and Minesota Orchestra certainly needs no special introduction; it is world famous among audiophiles and music lovers and for a good reasons: the sound quality and musical performances are of staggering quality. The first track “Dance Of The Tumblers” was rendered with extreme precision, resolving power and thunderous dynamics, through the JPS Labs Kaptovator and Superconductor V line of cables cables. The ability to hear a highly layered soundstage with tons of information presented with the highest degree of musicality, was certainly very surprising. I have heard this track countless times and with many different cables but it was rarely reproduced with such fidelity and ease. The “BabaYaga” is also a very demanding track that was reproduced through JPS combo with extraordinary levels of transparency and at the same time sounding highly refined. Moving to the realm of Jazz music. I really feel an urge to point out to the excellent McCoy Tyner`s album “Guitars”, which features performances by Tyner accompanied by Ron Carter and Jack DeJohnette with Marc Ribot, John Scofield, Béla Fleck, Derek Trucks, and Bill Frisell. The opening track "Improvisation 2" (Ribot, Tyner) is a...well, a striking improvisation and the lively quality of the McCoy Tyner`s piano was shown with a stunning sense of immediacy through the JPS Labs cabling family. The magic word here is PRESENCE. Although the whole album, from the beginning to the end is full of musical surprises, let me just mention a few “must hear” tracks like the bebop`ish "Mr. P.C. ", the traditional "Greensleves" or the dreamy "Boubacar" (with Bill Frisell). The JPS Labs cabling reproduced all the fundamental tones and overtones of the McCoy Tyner`s piano without editorializing and it also managed to project its imposing size with all the splendor - likewise could be said for the rest of the instrumentation. The ability to communicate the musical message and soul of the performance was demonstrated in a most overwhelming way. The JPS Labs` Superconductor V line of cables along with their Kaptovator Lite power cord, represent a stunning achievement in many regards. 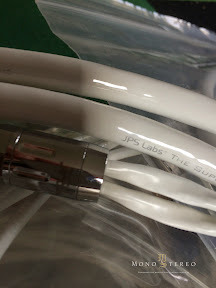 In the past few months I have had the privilege to try many cables, some costing much more than each of the respective JPS Labs cables, but during the whole testing period I have had a feeling they provide performance levels that reach far beyond their respective price points. Listening to the Kaptovator Lite power cord and the Superconductor V line of cables was highly enjoyable and they are true keepers.